All of our unframed prints are signed & are limited to 100 copies. These prints are supplied with a pale ivory mount and will then fit into frames that are 12" x 10" and 10" x 8", respectively. 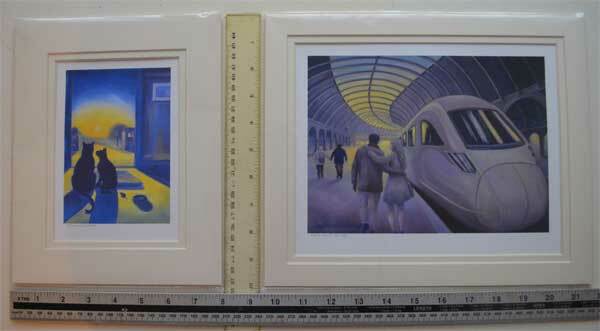 Here you can see both sizes of prints against a ruler, to show the size. We can supply other sizes of prints, up to A3 (11.5" x 16.5" or 297mm x 420mm). Please contact us for details and prices, quoting the name of the artwork and catalogue number. When standard sized prints are not available please contact us to order a print, quoting the name of the artwork and the catalogue number. Prints are displayed using a card surround called a mount (or mat), held in a frame behind glass. Non-reflective glass is ideal for pictures hung near windows. Our prints have pigment based inks, and are printed on archival matte paper. The prints are light fast (do not fade), unlike the dye based inks used in popular desktop printers. It is advisable to keep all prints away from direct sunlight. The prints should not be exposed to damp or humid conditions as this can cause deterioration. Always handle the prints with clean, dry hands and do not touch the printed surface. Ideally, acid free mounts (mats) should be used, although this is not essential. 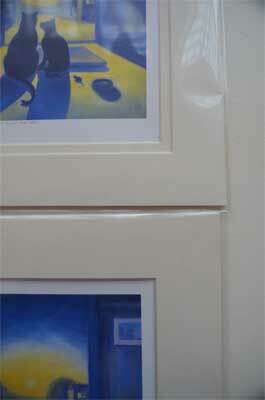 Framing the prints promptly is the best way to protect them, but they can also be stored indefinitely in sealed polythene bags.